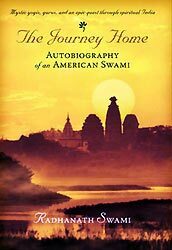 At the famous Kumbh Mela site, Richard (now Radhanath Swami) sat on the bank of river Yamuna and gazed at the sky. Right then he saw a hawk dive into the waters and catch a fish. It all happened so fast and Richard reflected on how we are like that unsuspecting fish. We carry on with our lives unaware that any moment the hawk of fate may shake us from our situation and impose on us suffering, death and tragedies. Richard felt the lesson to learn is to go deeper in spiritual life. If the fish had been swimming deeper, the hawk wouldn’t have probably been able to catch him. Similarly if we are absorbed in our connection to God, we’ll be able to deal with sudden calamities with sobriety and a stable mind. Radhanath Swami once gave the example of a boat in the ocean. A boat may be in the water but it cannot allow the water to enter the boat. Similarly we have to be in the ocean of this world but can’t allow the water like situations and problems of this world to affect us. Like the good boat we have to be in the world but not of the world. We can do that if our consciousness is fixed at the Lord’s holy names and form. Radhanath Swami says we have to go deeper in our spiritual lives by connecting to God in the innermost chambers of our heart. He compares the heart to a palace with many rooms. In the centre of this palace of the heart there are private chambers. It is in these regions of the heart- the deep internal recesses- we keep our private life with separate desires. Our challenge therefore as spiritualists is to allow God to enter these chambers or give these chambers to God and allow him to access. Unfortunately for most of us these private chambers are locked and God can’t enter our innermost areas of the heart. Going deep in spiritual life essentially means opening this part of the heart for God. This is the toughest internal fight in our lives and if we can do that we enter a deep relationship with God. Very nice analogy of the hawk and the fish. We should also be engaged deeply in devotional service that we are not affected by Maya which strikes on the surface. 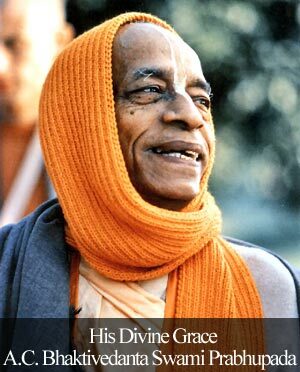 Nice instruction by HH Radhanath Swami, i.e., constantly be absorbed in chanting and hearing Krishna Katha, as otherwise it is very easy to become prey to material illusions. “The higher taste comes from absorption in acts of spiritual services like chanting of God’s names, hearing about spiritual subject matters and rendering various kinds of services.”-Nice to know this! SO many beautiful lessons taught by Swamiji in this sweet article…..thanks. we have to go deeper in our spiritual lives by connecting to God in the innermost chambers of our heart. A very practical way given by Radhanath Swami to come over our mood swings and focus on values. Radhanath Swami Ki Jai ! Hare krishna !! Radhanath Swami Maharaja is himself absorbed in the spiritual practices and that’s why he is able to demistify this difficult question on a practicle level. Only by gaining higher taste can one be freed of the lower tastes. Very nice lesson Radhanath Swami has given here. We have to have strong conviction for our spiritual practices. We carry on with our lives unaware that any moment the hawk of fate may shake us from our situation and impose on us suffering, death and tragedies. Herein Radhanath Swami tells us how is the nature of this world.There is danger at every step and we do not know when the lord of death would come and pick us from this world and where we will go in our next birth.Therefore it is very useful guidance herein by Radhanath Swami to remain absorbed in loving devotional service unto Supreme Personality Godhead Lord Sri Krishna who will ultimately helps us remember Him at the time of death.This is only the goal of human form of life. Absorption is the very essence of Spiritual life. Nice mediation by HH Radhanath Swami on how to keep our minds constantly engaged and abosrbed in glorifying Lord so that we don’t have any time for material pleasures. Thank you Radhanath Swami for sharing this wonderful formula of “how to be in this world but not to be of this world”. Absorption is the key thing in spiritual success! A meditation that needs to be in the forefront of our minds. It will surely help me & all in there meditation. Thank you for sharing this wonderfu; article :). Thank you Radhanath swami for your practical tips to controlling the mind and engaging in activities beneficial to our spiritual life. If the fish had been swimming deeper, the hawk wouldn’t have probably been able to catch him. Similarly if we are absorbed in our connection to God, we’ll be able to deal with sudden calamities with sobriety and a stable mind. A much needed message to hear for the flickering and attention-deficient mind. We need to be absorbed somehow or other in the devotional practices we do. 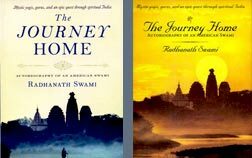 Thank you Radhanath swami for sharing this inspiring and though provoking article.